Hey everyone! So this week’s Disney Cooking Adventure was making Chili Cone Queso from the Cozy Cone Motel in Disney’s California Adventure Park! *The sugar cones we bought were fine, but I would suggest getting larger waffle cones if you can find them so you can make a bigger cone! *I couldn’t find refrigerated bread loaf in a tube so I used pizza dough instead and it worked just fine! Carefully cover each waffle cone with a layer of aluminum foil. Spray outsides with non-stick cooking spray. Set aside. Open tube of bread dough. You should have a long roll. Cut it into 6 even pieces with a pizza cutter or sharp knife. Take one lump of dough and place it on a flat, clean surface. Roll it back and forth with hands until you have a long, thin snake. Continue to do this until it measures 36-inches. *This was by far the most difficult step of the process. Since we used pizza dough instead of tubed bread loaf it was super elastic and hard to roll out into really long snakes. Instead I made shorter snakes around 12 inches long that were thicker. These worked perfectly because the ice cream cones we bought were a little bit smaller. Take the strip of dough and begin wrapping it around the foil-covered cone, starting at the bottom and working your way up. Press the end into a lower layer to seal. Set this on a baking sheet lined with parchment paper. Do this for the remaining lumps of dough and cones. Place the cones into a preheated oven and bake for 15-20 minutes at 350 degrees (F) until golden brown. 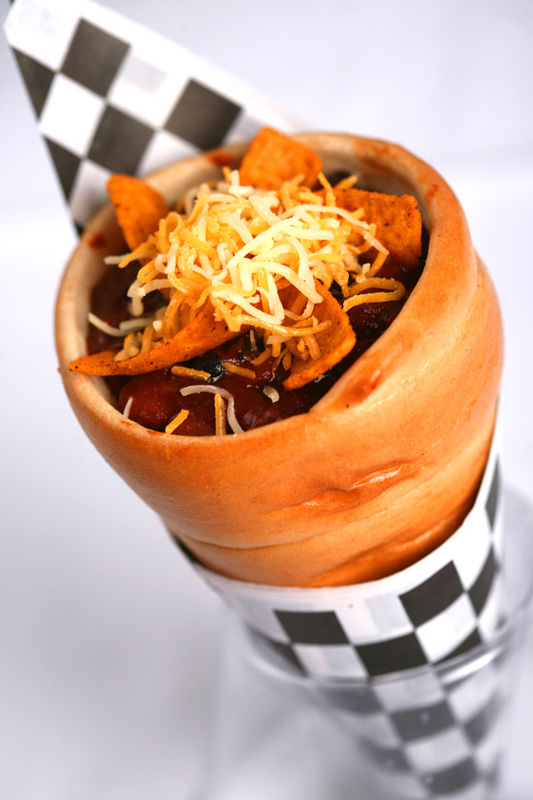 While the cones are baking, pour the cans of chili into a saucepan and heat on medium-high heat. Remove the cones from the oven and set them on the counter for a few minutes until they are cool enough to touch. Carefully slide the foil-lined ice cream cones out of the bread cones. Stand them upright in narrow glasses to fill. *When you do this gently twist the bread cone in the opposite direction it was wrapped. This will allow for the cone to slide off easily without tearing the bread or breaking the ice cream cone. (Props to Emily for this discovery). Sprinkle a bit of cheddar cheese into the bottom of each bread cone. Now spoon the chili in. Top with corn chips and another sprinkle of cheese. Serve immediately. Enjoy!! It turns out that Chili Cone Queso is not that hard to make! Next time around I would definitely find larger ice cream cones to form the cones around so they are bigger, but other than that this process was actually pretty simple. The recipe was well made and easy to follow which made for a good finished product (a finished product that Emily and I actually ate too!). I would definitely suggest trying this recipe. Have any Disney Parks recipes you want to see us make? Leave a comment below and don’t forget to share with your friends!